Cameras with fish-eye lenses (360°) aren't a recent invention. IPIX, pioneer of cameras with fish-eye lenses, registered his first patent in 1993. This idea excited me since my first contact with IPIX in 1999. At the time, the technology was used only with photographic cameras, more focused on the real estate market, providing a 360° tour from the interior of properties for sale. The first company to launch a CCTV camera with fish-eye lenses was Philips - current Bosch - about a year or two later. Later, Sensormatic also offered his version and after others emerged. But none of them had much acceptance and the idea didn't take off, mainly because of its low resolution, since cameras used were analog (there was nothing better then). And 360° camera was left behind for many years until recently as due to the advent of megapixel resolution sensors, they become more feasible. The fact these cameras can capture all the image around it, while PTZ cameras can capture only the image where their lenses are pointing to, it is a definite advantage, and may even replace multiple fixed cameras. What bothers me is that some manufacturers are calling these virtual PTZ cameras, offering them as perfect substitutes of PTZ cameras - since they have no moving mechanical parts - even venturing to say that the end of the latter was already decreed. But just because being megapixel, we shall in its digital zoom, the same level of PTZ cameras' optical zoom? At a first analysis, comparing one analog speed dome camera with a 360° camera of 3 or 5 megapixels that have, respectively, 6 or 17 times the resolution, it seems so. Not at the maximum zoom, that can reach 35 times or more in a PTZ camera, but maybe enough for indoor use. One of the first problems is that fish-eye lenses captures a plane circular image in the center of the sensor, namely, doesn't use the entire sensor area for storing information. Therefore, one can not consider the full resolution of the sensor, only about 59% of it. For this reason, some manufacturers extend a bit the image, obtaining a slightly larger recording area, about 78% of the rectangle, but it cuts the obtained image at the top and the bottom. Then a Dewarping software transforms that plane image into a circular half sphere (like a dome of a speed dome camera) where you can "walk" through the image, as if you were operating a speed dome camera. In this processing, the area in which a circle (πr2) is transformed into the area of ​​a hemisphere (2πr2), maintaining the same number of pixels, resolution is halved since area doubles. Sensor's area resolution: 2048 x 1536 = 3.14 megapixels. 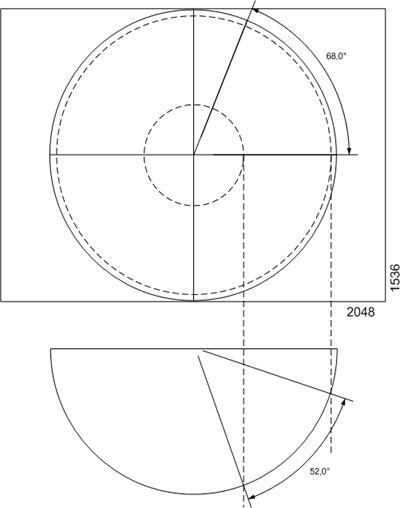 Circle area's resolution: π x (1536/2)2 = 1.85 megapixels, 58,90% of rectangle's area. Half dome resolution: 0.93 megapixels, less than one third of sensor's resolution. For the same sensor size, but with the extended image, we have: 78% of 3.14 megapixels = 2.45 megapixels. Half dome area resolution is 1.23 megapixels, a little over a third of sensor resolution. As the table below, for the fish-eye camera, we have a picking only 8.87% of the sensor area with 610 x 457 pixels, lower than a D1 resolution image. As for the extended fish-eye, we have an image covering 12.83% of the sensor area with 734 x 550 pixels, only 17% higher than D1 resolution. If we take a digital zoom of 3 times only - equivalent to a 10.8mm lens - we'll have, for the fish-eye camera, a resolution of only 246 x 185 pixels and, for the expanded fish-eye camera, 296 x 222 pixels, both much lower than D1 resolution. Circle area's resolution: π x (1536/2)2 = 2.89 megapixels, 58.90% of rectangle's area. For the extended fish-eye, we'll have : 78% of 4.91 Megapixels = 3.83 megapixels. Resolution of the half dome area will be about 1.92 megapixels. The equivalent of a 3.6 mm lens for the fish-eye camera resolution is 762 x 572 pixels, only 26% better than D1 resolution. For extended fish-eye camera, resolution is already better: 917 x 688 pixels. - Great advantage of fish-eye cameras is that they can view - and record - all that is happening around, and you can take a virtual pan and tilt from recorded or live images, but you cannot count much on digital zoom. Four cameras with lenses of 90° opening - mounted each pointing to one direction - also display a wide picture with 360°, without the need for Dewarping software . If we connect to the local network an analog 4-channel DVR recording at D1 resolution, with 4 CCD 1/3" cameras using 2.5 mm (90°) lenses, we will have an even better result than with a 360° camera. And much cheaper. Total resolution would be 720 x 4 x 480 = 1.38 megapixels; just a little bit inferior than that obtained with a 5 megapixels camera (1.49 megapixels). If we use 4 cameras with megapixel resolution, even better. The only problem with this solution is that four cameras with 90° opening lenses bow images on the sides, preventing a perfect seam between them. So the best would be to use 6 cameras with 60° opening lenses (use 3.5 to 8mm lenses and fine-tune manually). For installation in walls (180 °), divide the number of cameras by half. Please have in mind that this arrangement of cameras does not cover the same area of ​​fisheye cameras, that provide 180 ° of tilt; lenses that cover 90° horizontally can cover only 74° vertically and lenses that cover 60° horizontally can cover only 47 ° vertically. Therefore, solution with 4 cameras covers only 148° of tilt; with six cameras, only 94° of tilt - a little more than the half. This implies that you will need to decide on the best tilt position (camera's tilt ) for each situation, but some area will always be uncovered. For installation in walls (180°, with half of the cameras), this is not as critical as for installation in ceilings. The pros and cons of each solution to 360° cameras created two streams between manufacturers: Those that offer cameras with 360° fish-eye lenses and those that offer a dome with 4 megapixel cameras (up to 10 megapixels each). In the latter case, images of four cameras are processed in the cameras itself, correcting the curvature created by the 90° lenses - the problem mentioned before - and integrating them into a single output with a unique 360° panoramic image. After all, which is the best solution? Mechanical PTZ, Fish-eye or 4 cameras in one? It depends. What I ever argue is there is no solution or technology that fits all situations. It is very important to know features and especially weaknesses of each solution, not to run the risk of offering a product that does not meet your customer needs. So here I tried to do a cold and impartial analysis of each solution, featuring both its positive and negative aspects. "But just because being megapixel, we shall [the fish-eye cameras] in its digital zoom, the same level of PTZ cameras' optical zoom?" Well, I guess it was proved that no. So do not believe 360° cameras goes eliminate speed dome cameras. And vice versa, because they serve different situations. And there are 360° cameras that work together with a speed dome camera. This is the perfect match: A 360° camera observes everything around and, when it detects a certain event condition, automatically positions speed dome camera to view details of the scene.